My husband is a HUGE soccer fan. He’s a soccer player who lives and breathes soccer. 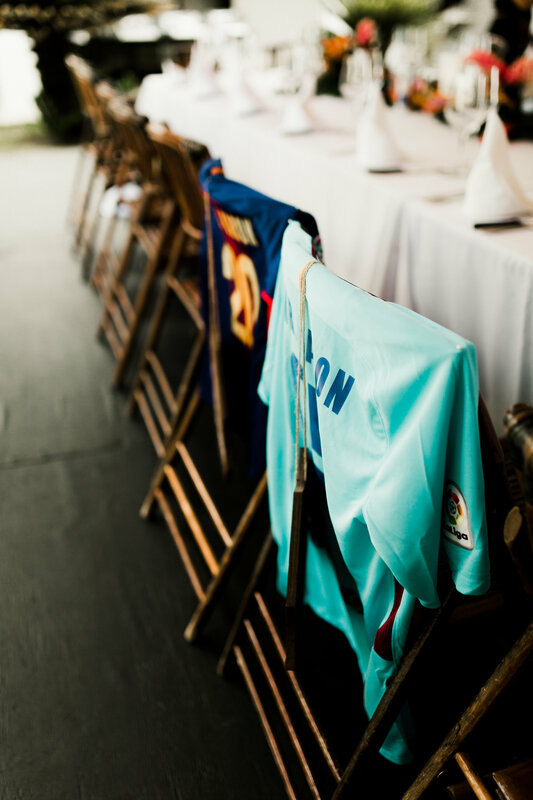 Because of this, I couldn’t plan our wedding without incorporating soccer into the wedding details. I searched Pinterest and Googled for soccer/wedding images, and nada! My inspiration for adding soccer was running dry– but I wasn’t going to give up. Literally days before the wedding, it finally came to me: Soccer Jerseys!! Instead of having the wood signs hanging from our chairs that read, “Mr. 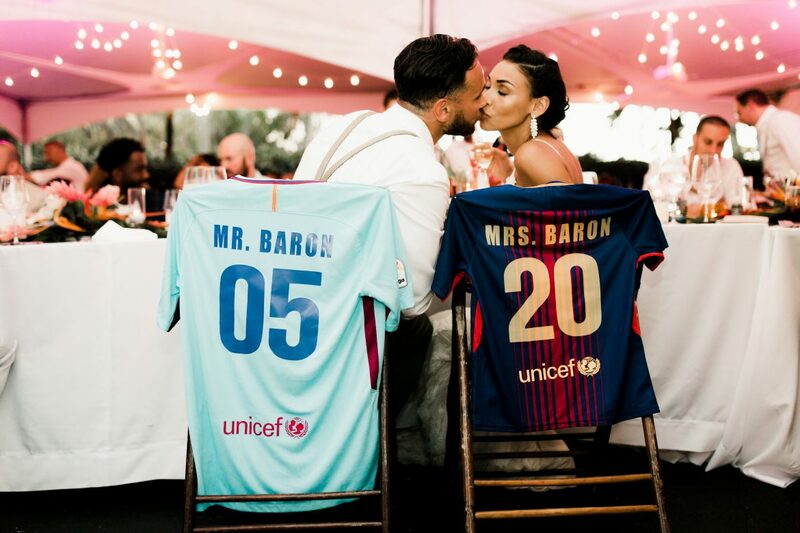 & Mrs.” (like every other bride) we decided to make personalized soccer jerseys with our last name and wedding date and hang them from our chairs. We picked the home and away Barcelona jersey since we visited the Barcelona stadium, Camp Nou, and Todd is a big Messi and Xavi fan. His jersey had the month of the wedding: “05.” My jersey had the date of the wedding: “20.” I thought we executed the idea perfectly! Later on in the evening, we even put them on! I slipped my jersey right over my dress and we danced the night away. Adidas has personalization on all Soccer Jerseys but are a bit pricey, for knock offs try this seller on Amazon. Since I had such a hard time finding any soccer inspiration, I wanted to make this post soccer specific. But…this idea would work just as well with any other sport! Every Wednesday, I’ll post a wedding style article and will also be accepting a wedding guest post. If you are interested in being a featured guest writer, please submit your wedding guest article to hello@lovefashionandfriends. Should your article be picked for publishing, I will respond to your email with the expected publish date. DISCLOSURE| SOME OF THE LINKS ABOVE ARE AFFILIATE LINKS, MEANING AR NO ADDITIONAL COST TO YOU, I WILL EARN A COMMISSION IF YOU CLICK THROUGH AND MAKE A PURCHASE. Who Is The Chick Behind This Blog?